The following awards are given by various divisions of the college and are designed to honor individuals that have made outstanding contributions to the community through their involvement, service, and leadership development activities. Be a full-time member of the current Senior Class. Has remained in good academic standing during his/her Skidmore tenure. Has compiled a distinguished record of co-curricular involvement during his/her Skidmore tenure. 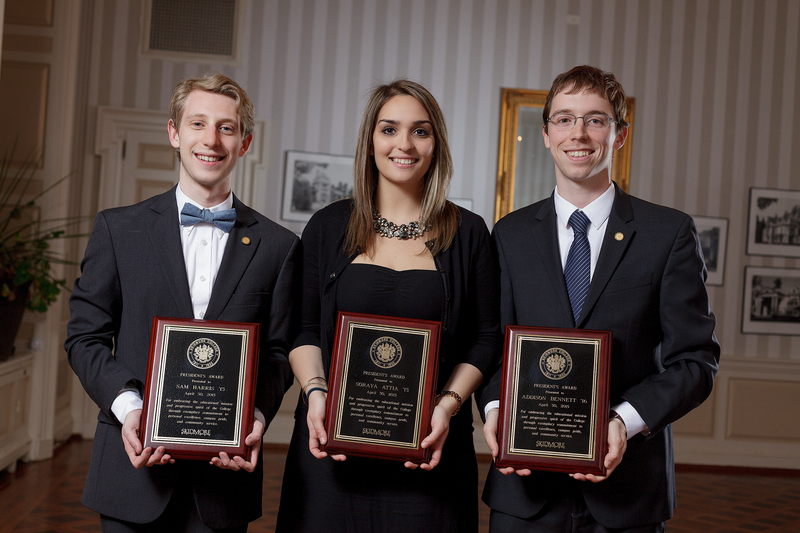 Has demonstrated exemplary leadership in contributing to the quality of Skidmore life. “Established in memory of Sara Bennett ‘92 and awarded each year to a student who has shown distinguished writing skills, energy and commitment to the highest standard of student journalism. Named in honor of Candy Carlucci Backus '66 who served as director of the Skidmore College Alumni Association from 1976 - 1985. It is presented each year to members of the senior class who exhibit boundless energy, contagious enthusiasm, and a capacity to energize all segments of the community, for it is those unique qualities which serve to insure the prosperity, security, and heart of Skidmore. This award, established in 1988 through the benefaction of Mr. and Mrs. William P. Dake, is given in recognition of a student's volunteer efforts in the Saratoga community during the past academic year. The award honors Charles S. Dake, past president of Stewart's Ice Cream Company, who was a Skidmore trustee for one year until his untimely death in 1978, and William P. Dake, current president of Stewart's and a Skidmore trustee since 1988. Both men's strong belief in the importance of volunteerism is exemplified by their own long records of active community service at all levels. Susan Law Dake, a member of the Class of 1971 and wife of William, is one of Saratoga County's most active volunteers and works closely with all of the Benef-Action organizations in the selection process for the Dake Award. Candidates for this award must be full-time members of the Skidmore student body in good academic and social standing. They must be nominated by the volunteer organization as individuals who have volunteered their time to the Saratoga Community on a regular basis throughout the academic year, or who have exhibited extraordinary efforts in support of the spirit of volunteerism within the Skidmore community. These awards, established in 1992, honors the memory of Jane Anne Hapeman who, through her work in the offices of Admissions and Student Academic Affairs over the course of eight years, assisted countless students in making the transition from home and high school to college life. Candidates for these awards must be full time upper-class students who are well-rounded individuals with diverse interests, strong character and high initiative, and who, like Mrs. Hapeman, clearly enjoy giving of themselves in helpful and supportive ways. Recipients for these awards are primarily nominated by first year students. These awards recognize Skidmore community members who have embraced the educational mission and progressive spirit of the College through their exemplary commitment to personal excellence, campus pride, and community service. The awards are intended to foster school spirit and campus unity, and they represent an opportunity to express our collective appreciation of outstanding work on behalf of the College. Established in 1999-2000, this award is presented to the SGA chartered club or organization that has made the greatest contribution to the quality of campus life. The club who earns this award has demonstrated outstanding dedication to the Skidmore community through its delivery of excellent services, entertainment, or education programs. The "Skidmore Thoroughbred Leader" awards recognize and thank graduating senior leaders who have contributed consistently to the co-curricular life of the College. These senior award recipients have unselfishly devoted countless hours of their time, as well as their energy, skills and talents to building a richly diverse and vibrant campus life at Skidmore.